Phillip Pich has dreamed about a career in welding ever since a middle school class sparked a passion for the trade. After high school, Pich, now 22, tried working in the oil fields, but the long hours and tough working conditions made it difficult to turn it into a long-term career. The job also conflicted with his Native American roots, which taught him to have a profound respect for Mother Earth. So when Pich learned that San Antonio solar manufacturer ERCAM Trackers is offering paid training for welders with a chance at a full-time job in a growing industry, he jumped at the opportunity. Myron Moffitt, 45, currently a machine operator for ERCAM Trackers, signed up for the training to switch to a trade that he’s always wanted to take up during his 20 years of experience. During the economic downturn, Moffitt lost his job in the auto industry and eventually came to San Antonio in search of new opportunities. ERCAM Trackers is recruiting people with basic machine skills like Pich and Moffitt to complete a free 80-hour training program led by Master Welder Marty Memmelaar. Upon successful completion of the course, which includes passing an exam evaluated by Memmelaar, participants will have the opportunity to join ERCAM as a full-time employee — with benefits and paid vacation. Master Welder Marty Memmelaar leads the free instruction at ERCAM Trackers, which will hire the best of those it trains. Four days into the training, the 23 students worked diligently in small teams to turn raw material into mounting systems for solar panels that will track the sun to generate renewable power for San Antonio. 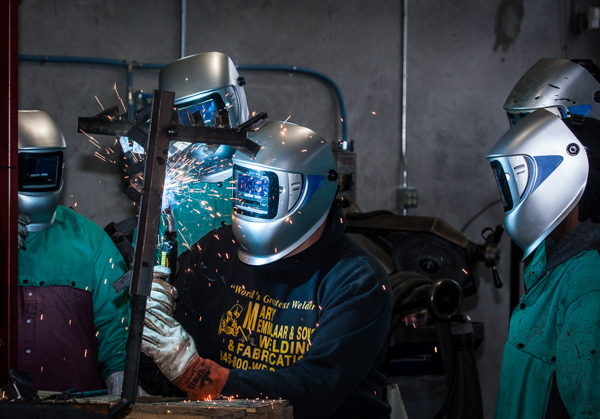 “More than half the trainees are already making perfect welds for the mounting systems and ready to go in the field to start welding,” Memmelaar said. ERCAM supplies mounting systems for OCI Solar Power’s 400 megawatt solar deal with CPS Energy, the largest economic development agreement between a municipal utility and private company. Alamo 1, a 41 MW solar farm that went online late last year, is the first of seven sites that will generate the total 400 MW. While the opportunity to work in a growing industry may seem attractive to welders, ERCAM had a tough time recruiting, because of competition with the oil industry, said Frank Taylor, vice president of production and procurement. ERCAM plans to offer the program until 90 welders are recruited. Registration is open for the next course, which begins in early February. Contact ERCAM at (210) 807-9880.